Like most kids, growing up I loved Velveeta mac and cheese. Those shells held the perfect amount of extra cheese in each bite, and I loved the way the sauce squeezed out of that packet. Unfortunately my mom didn’t have the same affinity and appreciation for my favorite cheesy sauce. She thought it was “too processed,” and insisted on making the homemade version. As a kid, all I wanted was that good, good, gooey, golden-orange sauce. But now that I’m a mom, I see the truth. As a kid I always wanted my mac and cheese to have that orange glow, but my mom’s homemade version was always white! Keeping with tradition, and because all of my favorite macaroni cheeses are white, my sauce is also a creamy white. My mom also used tricolor rotini wheat pasta. In this case, I did break with tradition and went with my favorite shells—for extra cheese storage. 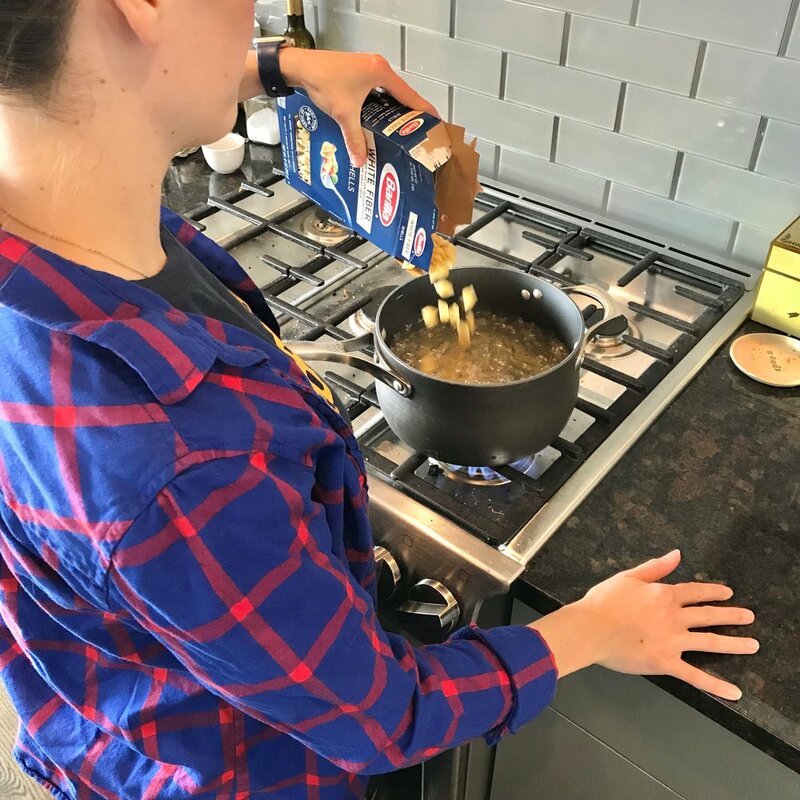 One secret ingredient that I remember my mom always putting on everything—from chicken to popcorn—was nutritional yeast. It can be found at almost any grocery these days (I use Braggs brand), and it adds a nice cheesy flavor to food. Prepare the pasta as per the package instructions, then drain and set aside. To prepare the sauce, heat the almond milk in a medium saucepan over medium-low heat. When you start to see small bubbles forming around the edge of the pan and steam coming off the milk, turn your heat down to low. In a small bowl, add the tapioca starch, then pour in 2 teaspoons of the steaming milk and mix until incorporated. 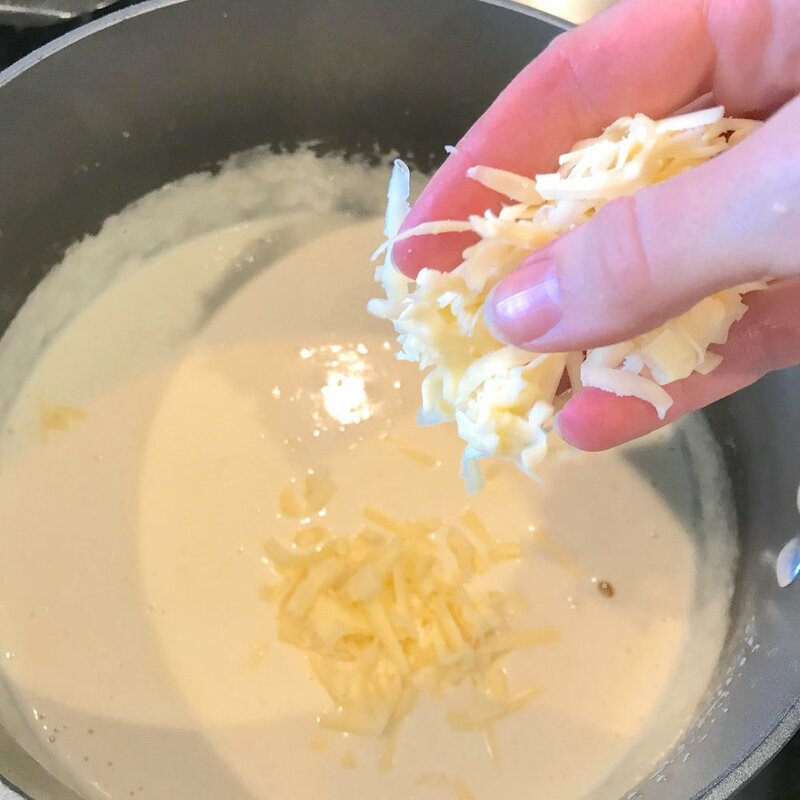 Transfer the tapioca mixture back into the saucepan of milk, and slowly add the Havarti and gouda, a little at a time. Once the cheeses are incorporated, add the nutritional yeast, white pepper, salt, and cayenne pepper. Allow the sauce to cook for 5 minutes on low heat, stirring occasionally. Pour the drained pasta into the saucepan and toss to mix all ingredients together; taste and season if needed. To serve, transfer the macaroni and cheese into a serving bowl and grate fresh pepper-crust cheese on top (if desired). Enjoy every gooey bite! Do not use pre-shredded cheeses.